Mangaluru , Mar 22, 2018 : Five eminent Aloysians namely V Ravichandran, CEO of Diya Systems, P Jayaram Bhat, Non-Executive Chairman of Karnataka Bank, Dr K V Rao, Director, Pilikula Regional Science Centre, Joseph Gonsalves, Chief Traffic warden and Jeevan Saldanha, entrepreneur will be conferred the "Eminent Aloysian Alumni Awards" at a function to be held at the Fr Rasquinha Hall of St Aloysius College on March 25. Informing this to reporters here on March 2, Thursday, Archibald Menezes, convenor of the event said the function would be held under the joint aegis of the St Aloysius College Alumni Association and St Aloysius College. He informed that the Eminent Aloysian Alumni Award was instituted by Fr Denzil Lobo, late Rector of the College and former principal in 2008. Until now as many as 34 outstanding Aloysians including Dr N Vinay Hegde, Chancellor of Nitte Deemed to be University, Yenepoya Abdulla Kunhi and Dr Deviprasad Shetty have been conferred the awards, he added. The selection is done by a panel of five judges. 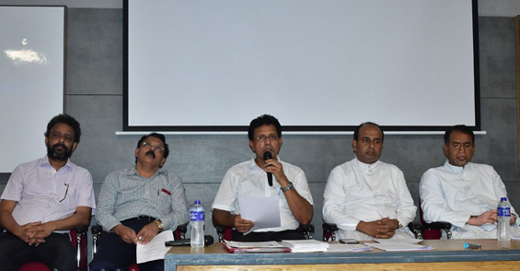 Fr Dionysius Vaz, Rector of St Aloysius Institution, D Praveen Martis, Principal of St Aloysius College, Dr A M Narahari, Registrar and Naveen Mascarenhas, Secretary of Alumni Association were also present.